Use to create tranquil environment and quiet the mind. 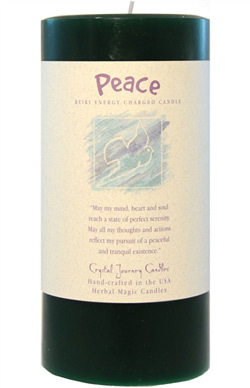 Use in combination with Harmony candle to create a loving home environment. .
"May my mind, heart and soul reach a state of perfect serenity. May all my thoughts and actions reflect my pursuit of a peaceful and tranquil existence." Ramakrishnananda Exotic Indian Resins - Shanti (Peaceful Home) - 2.4 oz.